William Porterfield’s side played out a thrilling tie against the Netherlands which sealed Ireland’s spot at the 2015 ICC Cricket World Cup. 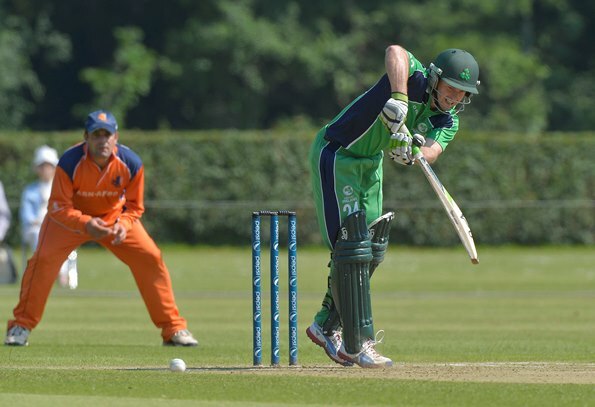 Michael Rippon hit the final ball of the game for six from Ireland’s John Mooney to secure a thrilling tie which gave both sides one point bringing Ireland’s total to 20 which means the the boys in green win the ICC World Cricket League Championship and become the first country to qualify for the 2015 ICC Cricket World Cup. The Netherlands batsmen have started well in their chase of Ireland’s 269 as their openers moved to 50 within 10 overs before Paul Stirling ended Myburgh’s cameo of 35. Wesley Barresi & Eric Szwarczynski joined forces to bring the Dutch to 95 for 1 at the first drinks break and very much leave the game in the balance. Three quick wickets in 4 overs for just seven runs turned the match on it’s head to leave the Netherlands 142 for 4 in the 31st Over. First Kevin O’Brien had Barresi caught behind, then Stirling bowled Szwarczynski for a well made 44. Then having faced just one ball, Michael Swart was run out brilliantly by Irish skipper William Porterfield at mid-wicket. A cameo from Daan Van Bunge of 45 from just 40 balls has kept the Netherlands up with the required run rate and Tom Cooper holds the key in a game that looks set to go right to the wire. The game has ebbed and flowed back and forth with Peter Borren, Tom Cooper and Mudhasser Bhukari all falling for late wickets bringing the game right to the last over. After winning the toss and choosing to bat first for the second time, Paul Stirling and William Porterfield got Ireland off to a flying start and brought up a fifty partnership in just the 9th over. Porterfield fell when attempting to slog sweep Michael Swart and 8 overs later Paul Stirling also fell to spin, the left-arm spin of Michael Rippon just one run short of his fifty for 49. Joyce was joined by Niall O’Brien and the two left handers saw Ireland past the halfway point going around 5 an over. Ed Joyce then progressed to an elegant fifty as Ireland looked set to post over 250. Niall O’Brien fell for exactly 50 and was followed soon after by his brother, Kevin for just 4 as Ireland looked to score quickly in the last few overs to post a challenging total for the Dutch. Gary Wilson could only make 5 before being bowled but Trent Johnston added some late impetus to the innings with 21 not out. Ed Joyce kept going at the other end and finished a glorious innings just short of his century as the innings finished with Ed on 96 not out.